My pointless has reported stories of some pretty strange allergies: the girl who is allergic to water, the girl who can only eat tic-tacs, the girl who is allergic to the 21st century and others. This week, Telegraph.co.uk reported another strange allergy: a woman who is allergic to her own baby. Joanne Mackie, 28, started developing blisters and a burning rash on her skin shortly after she gave birth to her son, James. 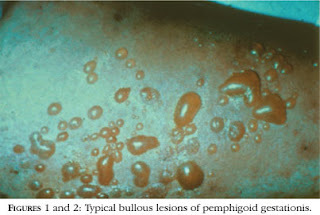 After doing a skin biopsy, doctors discovered that she has a rare skin disease known as Pemphigoid Gestationis (see picture). This disease developed in Joanne during her pregnancy and causes her to have an allergic reaction to contact with her own baby. It is not a psycho-somatic illness. The allergy is physiological and Joanne's pain is very real. Joanne said to the Telegraph, "At first, when I was told I was allergic to my own baby I thought it was some sort of joke... But when it sank in I was totally devastated. It felt like my world had caved in. It was such a heartbreaking time. I had to watch while my husband gave our son his first bath." The allergy fist appeared when Joanne tried to breast-feed little James. She said that her hands started tingling... Then the tingling became a rash that eventually spread over her entire body. Fortunately, steroid therapy for a month has been effective and Joanne can now hold her baby without pain. She said, "A cuddle from your own child is the most precious thing in the world and now I can cradle my little lad, it's heaven. I never want to let him go now." for the other allergy stories mentioned above, click on the "allergy" label below or in the label cloud.